Whatever style of education your kids are receiving right now, whether it’s homeschooling, unschooling, democratic schooling, private school, public school—honestly ask yourself this question: Are they happy? Are they thriving and growing and loving life? If the answer is yes, don’t change a thing. If you feel compelled to change something for some other reason, such as that they aren’t learning X, Y, or Z, my advice to you is this: open your eyes and appreciate what you’ve got. 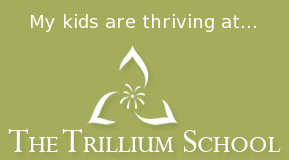 Your kids are happy and thriving and growing! Why would you want to mess with that? We have such a preoccupation in our culture with the content of what kids learn. We get constantly distracted from what’s in front of our faces. The key to making good decisions for your kids—and helping them make good decisions—is to pay attention to what’s happening now. Don’t get caught up with the future or the past. Are they happy where they’re at? Then let them be. What are the prime conditions for learning? Witnessing my own kids, I can tell you that they grow and learn at an amazing rate whenever it’s obvious that they really love life. It’s when they’re experiencing sustained difficulty or discontentment that we start to question the way we’re doing things. Some kids are happy, but their parents aren’t happy for them. What’s wrong with this picture? Who has a problem—the kids or the parents?